St Joseph’s College 1st year basketball team: Back row: T O’Malley, G Lyons, C Naughton-Saalman, L Nolan, I O’Sullivan, E Kelly, P Gillick, C McNairney. Front row, C Fopuhunda, D Greally, R Ariton, J Lyons (cpt), K Burke, S Conroy, R Oates. The Bish first year basketball team won silver in the All Ireland schools A finals in the University of Limerick last weekend. 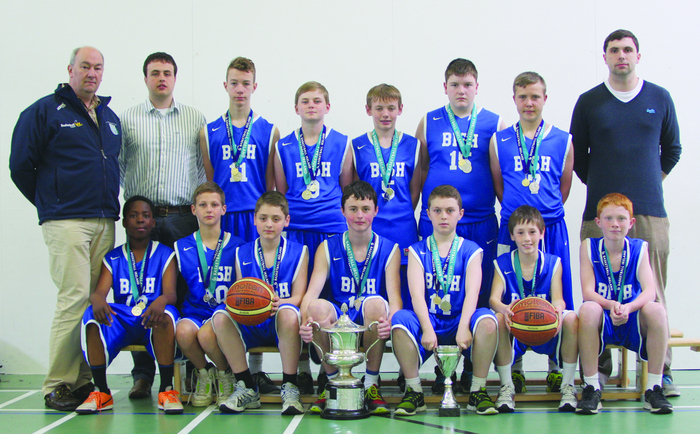 The Bish travelled as Western Regional champions, having defeated Calasanctius College, Oranmore, in March. In the play-off pool games, the Bish defeated Colaiste Choilm,Tullamore, and St Fintan's Sutton to proceed to the All Ireland quarter-final against Moyle Park College, Clondalkin. It took the Bish time to settle, but in the end they ran out comprehensive winners by 18 points to set up a semi-final with Presentation College, Bray, who had earlier defeated Calasanctius College, Oranmore. In a tight game, the Bish took control in the final quarter through captain James Lyons. And, with Kevyn Burke, Iarlaith O’Sullivan and Aaron Kiernan causing difficulties for the Presentation defence, Liam Nolan was in good shooting form when it mattered. In the final against St Pat's, Castleisland, the Bish stayed with the strong Kerry team until losing momentum when captain James Lyons was forced to retire. St Pat's scored 10 points off fast breaks in the second quarter which was the difference between the teams and they went on to deservingly lift the trophy.